As footballing claims to fame go it is an unusual one and, strictly speaking, not entirely true. Nonetheless, every other Saturday at Palmerston Park in Dumfries the lyrics blare out via the speaker system. "We've got God on our side, we're the only team in the Bible," the pre-match anthem proclaims. It refers to lines which can be found in the holy book - by those who care to look - which begin: "The Queen of the South will rise...". The eagle-eyed, and mildly pedantic, have pointed out that there are teams beyond the Scottish Championship side who also get a mention. However, when you don't win too many trophies, these are the kind of things supporters cling on to. Despite the fact they will not be picking up any silverware again this season, this is nonetheless a special time for anyone who holds the Doonhamers - as the club is nicknamed - dear. For it was back in March 1919 - exactly 100 years ago - that they were formed from a merger of other local sides. The name, the club website tells us, came courtesy of a local politician who had dubbed Dumfries the Queen of the South while on the campaign trail in the mid-19th Century. It emerged as the preferred choice for the name of the new team and has stuck ever since - some wags would suggest through thin and even thinner. Depending on who you supported, it was either one of your finest hours or darkest days. 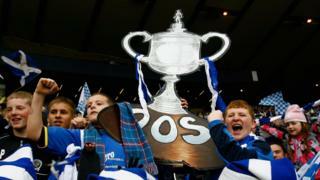 For neutrals, though, Queen of the South versus Aberdeen was one of the greatest ever Scottish Cup semi-finals. The ebb and flow and a lunchtime kick-off left fans of the Dumfries side feeling decidedly light-headed at the final whistle. It finished 4-3 for the Doonhamers but it felt at times like a basketball game with both sides scoring every time they went on the attack. It paved the way for a narrow Scottish Cup final defeat by Rangers and a passport to Europe. And that was something few Palmerston Park regulars ever thought they would live to see. But, for fans, there is no other side they could possibly follow, despite the only very fleeting moments of success. The Dumfries side sat top of the old First Division back in the 1950s and finished fourth - their highest ever spot in the top division - back in the 1930s. They have been champions of Scotland's second and third tiers on a number of occasions. And the Challenge Cup - Scotland's trophy for lower league sides - has come their way twice while they have made the Scottish Cup final once. That, in turn, paved the way to their only season of European football with home and away ties with FC Nordsjaelland of Denmark. Ask any supporter who made that trip a little more than a decade ago and they are probably still grinning about it now. They have had their share of heroes too - from Scotland international Billy Houliston to goalkeeper Allan Ball, the appearance record holder for the club. Nowadays, home crowds rarely top 2,000 but more than 26,000 once packed their ground for a clash with Hearts back in 1951. And the Hollywood legend Robert Duvall once graced the turf too, when filming his Scottish football movie, A Shot at Glory. Those moments, and much more, will be remembered this weekend at an anniversary dinner expected to be attended by hundreds of people. It will also see new names inducted into the club's hall of fame - including current striker and goal hero Stephen Dobbie. This season has proved a tough one with hopes of a promotion play-off place rapidly turning into fears of a relegation dogfight in recent weeks. Nonetheless, this is still a time to celebrate a team which has given both despair and delight to Doonhamers down the decades. Then they will all return to saying their prayers for divine assistance in avoiding the drop in such a special season.